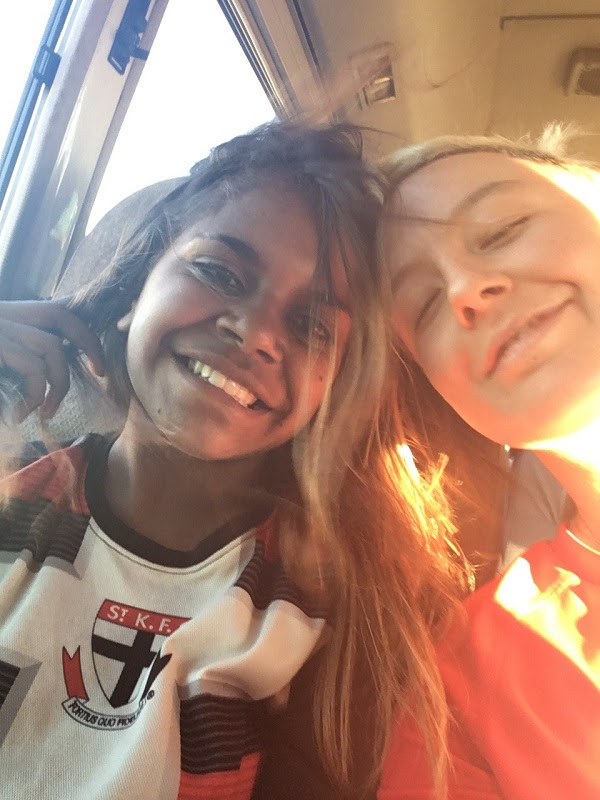 In the lead-up to Reconciliation Week last week, Fitzroy-ACU Women’s leadership group member and player, Emilie Goegan, headed up to Alice Springs with her employer, Red Dust, a not for profit which delivers health promotion programs for remote Indigenous communities. Red Dust also sponsors Emilie at Fitzroy. She told us a bit about her experiences including learning some deadly new footy skills. Q. Tell us a little about how you heard about Red Dust and why you got involved? How does Red Dust plan to make a difference? A. I started as a volunteer at Red Dust mid-2016, as Indigenous health and rights have always been a passion of mine. Generations of Indigenous Australians in remote communities have lived a life impacted by poor health. This affects the whole community, especially young people. Red Dust believes that good health is the key to a bright future and that health outcomes can only be made possible through a two-way exchange with communities. ​A. I am the Red Dust Business and Communications Manager in the Melbourne office. A pivotal part of my role includes ​program delivery at least four times a year, although as this year it looks like it will be more. Q. When you go on these trips, what is the purpose; what do you do? ​A. At Red Dust we have three core programs. The Healthy Living Program focuses on youth nutrition, health and exercise. We aim to bring out strong role models such as professional athletes to help inspire and motivate the kids to come to school and gain education on healthy living choices. We also have Strong Young Women and Strong Young Men and Boys Programs respectively where we focus on gender-specific ​health issues and positive life choices. Red Dust wants to maintain our aim of health promotion and education, as health is everything. Q. What do you see out on country that you wish every Australian could see? ​A. I want our country to see the incredible and strong community members I see each time I deliver a program. 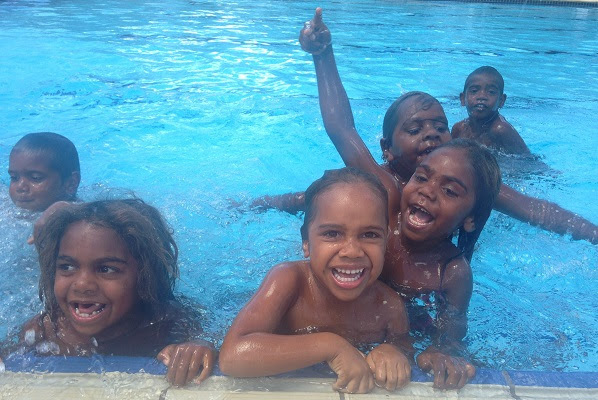 Indigenous communities are often stigmatised with a lot of negative media. But there are amazing individuals positively contributing to their communities, schools, families and their culture; strong Indigenous leaders, teachers, support workers, police officers and parents. Q. 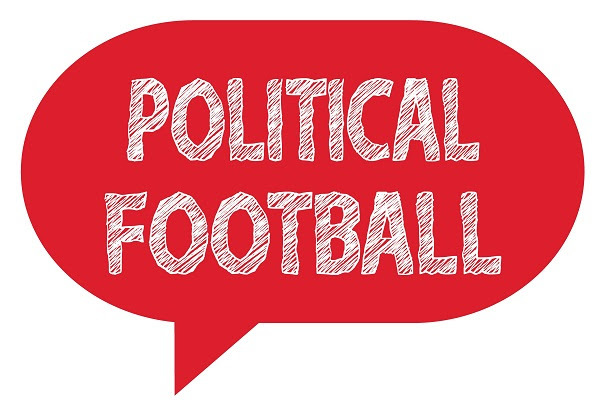 Is sport and football a good way to lead into other conversations with Aboriginal communities? ​A. Over the years we have had great involvement with numerous AFL players, such as James Hird, Cyril Rioli, Luke Darcy and Will Minson to name a few. AFL is a hugely popular sport in all communities and has grown some spectacular athletes. As many believe the rules of AFL are largely borrowed from the traditional Indigenous sport called "Marngrook", football will always be a special sport in Indigenous culture. Q. Did you get to play a game of footy while you were up there? What was the experience like? What skills are you bringing back to W2? ​I was fortunate enough to train with the deadly Alkamilya Panthers​ women's team. The girls, like the Fitzroy teams, have a variation of ages from mums to their daughters! For a brand new team, the natural athleticism and flare for the game was incredible, and there coach Shaun Cusack was fantastic. Next time I am up there for work I have been invited to play on game day which will be super exciting! Shaun and the girls were incredible at booting long distances goal on the run which I hope to see more in the mighty Roy Girls! Lunch with The Premier – Sold out! When we want to know what's going on around the State here at Fitzroy, we go straight to the top. Victorian Premier Dan Andrew is the guest speaker for the Reds Foundation pre-game lunch on Saturday 17 June and the lunch has already sold out in record time; just over 48 hours. The Reds Foundation's Annual Half Back Benchers Luncheon has become something of a regular feature on the Fitzroy calendar, with Richard Willingham and Peter Hille working their connections to ensure a great night. The special lunch will set the scene for the big clash between Fitzroy and Old Scotch. As a tall, country boy Dan may well have pulled on the boots at some stage and no doubt he's been through some tough times recently as a Bombers' fan. Let's see what wide ranging topics Peter Hille and the Premier might cover during an intimate lunch with the Reds Foundation. Look out for the next lunch guest announcement; it’s bound to book out quickly too. The Fitzroy-ACU Women 1 continued their winning ways and held onto the Hipster Cup with victory over the Brunswick Renegades at Vic Park on Saturday. 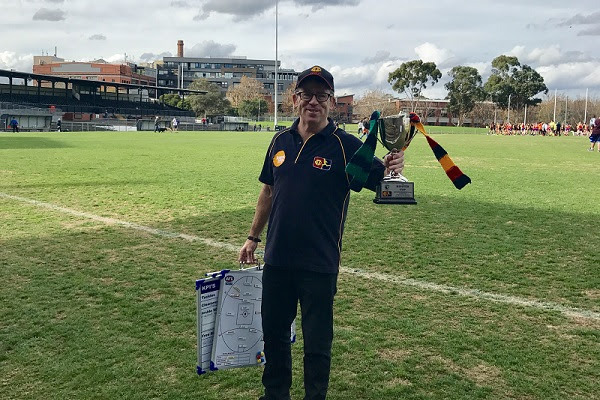 Fitzroy has held the Cup right from the start of the rivalry two years ago and coach Mick Symons wasn’t planning on giving it up. The win was again convincing; 6.9.45 to 2.0.12. 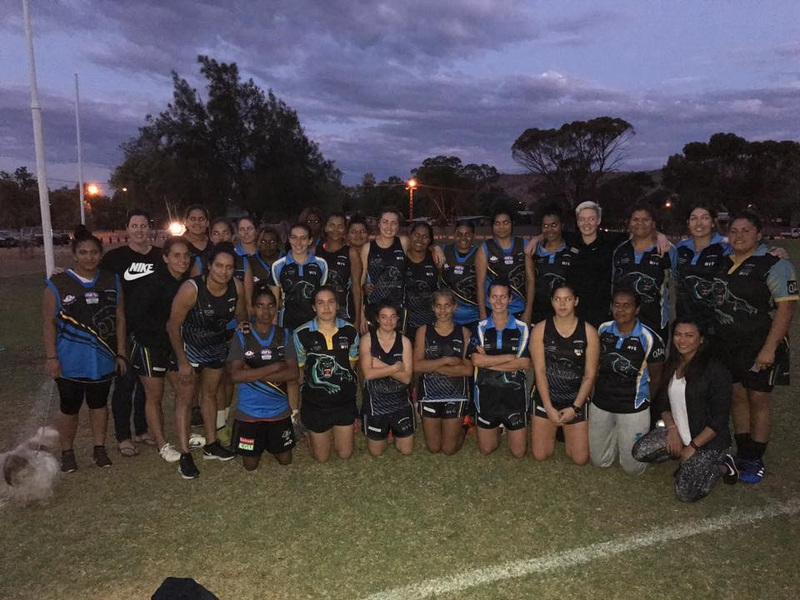 And if you thought they were playing well, the team might step it up another notch after training during the week with some tips and advice from AFLW players Lauren Brazzale (Carlton) and Christina Bernardi (Collingwood), who are team mates when they are playing with Diamond Creek. Lauren and Christina took training and a Q&A session after the game. This weekend Fitzroy-ACU Women 1 will meet Old Trinity for the first time at Hughes Oval, Bulleen. The two teams are even on 6 wins apiece, with Fitzroy holding second spot with superior percentage, so expect a tough contest. Fitzroy-ACU Women 2 will play Swinburne Uni AFC at St James Park in Hawthorn this weekend, having gone down to Canterbury at Vic Park last week; 0.1.1 to 5.5.35. The Reserves were the big winners at Brunswick Street on Saturday, with Will Pickering bursting back onto the scene with a seven goal effort at full forward to lead the team to a 15.10.100 to 9.12.66 win. Aside from Pickering’s return from injury, it was also good to see Sam Baker back and making and impact and Max Davie working hard to push for senior selection. Mitch McWhinney was also a standout. Currently sitting in 9th position, the Reserves need to keep winning to get back up into the middle of the pack. The Seniors were ruing missed opportunities and their final quarter effort on Saturday, after a tight and competitive three quarters against Monash Blues. 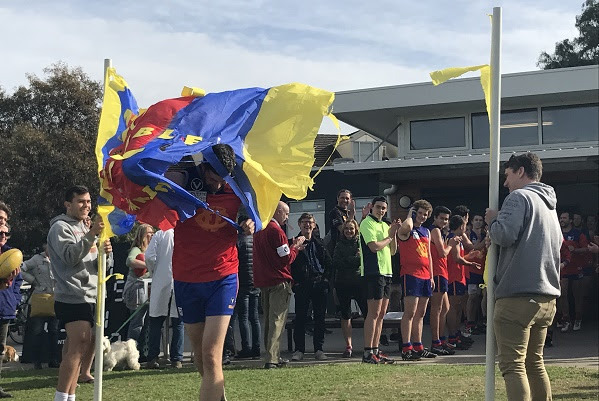 With all to play for and a margin of just two points at three quarter time, Monash took the initiative and kicked nine goals in the final term to blow Fitzroy off Brunswick Street Oval; not something that happens often. It should be noted that Fitzroy had thrown everything at Monash in the third quarter, only to kick one goal 7 for their efforts. In contrast 9 goals 1 was Monash’s return in the last. The absence of captain, Rory Angiolella, and reigning best and fairest winner, Aidan Lambert, were not being used as excuses as the team looked for answers about their inconsistency, not only between games but also within games. Again the Fitzroy team featured several Under 19 players who are definitely showing plenty of glimpses of their skills and talent and a big upside for the future. Nathan Ligris was the standout best player, with the team welcoming Luke Baker back into the fold with a strong game. Having dropped two winnable contests in the last two weeks the team will play away this weekend against Old Carey in a crucial game before the bye. In the meantime, the Fitzroy Under 19 teams are struggling, with Under 19 (1) going down to Williamstown and Under 19 (2) showing the challenge of starting a new team and having another very difficult day against Ormond. Oscar Sutcliffe was the best player for the Under 19 (1) team with Noah Wright kicking two goals. James Ziemkiewicz was best for Under 19 (2). Congratulations to the Thirds and D-Rock (Dan Ryan) who came away with a big win over the Monash Blues on Saturday, 13.15.93 to 4.7.31. Simon Heather (5 goals) and Tim Denatris (3 goals) led the charge, but it was the pre-game preparation which really shone! Aside from badges with the players’ photos, the team had also constructed a banner to welcome D-Rock onto the field at Ramsden Street celebrating his ‘200 serviceable games’. It was a great atmosphere out at Ramsden Street with plenty of Dan’s family gathered to celebrate the milestone. Well done to everyone involved. A lifelong Fitzroy fan, life member and long-standing Board member, Tom Sargant, has stepped down from the Fitzroy Board after 13 years’ outstanding service for the Roys. 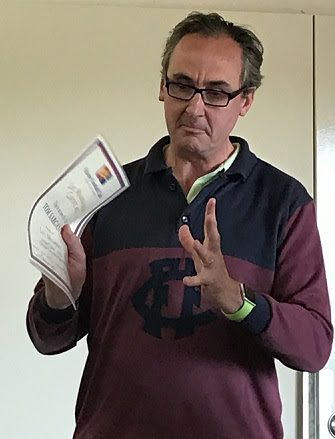 It is hard to know how to replace the man who has been a staunch custodian of the Fitzroy history and heritage, taking great delight each week in starting the BSO games with the Fitzroy song. Tom started following Fitzroy when he was in Grade 4 (1975). “I had toyed with Richmond (because they were winning at that stage), Melbourne (because of my brother), Essendon (because my mother’s Uncle was the longest-serving club secretary… they named a stand after him at Windy Hill! ), and North Melbourne (because of my father). But I settled on Fitzroy, because a mate of mine bribed me with a key ring. This was just before they were doing really well from 78 to about 88,” Tom said. 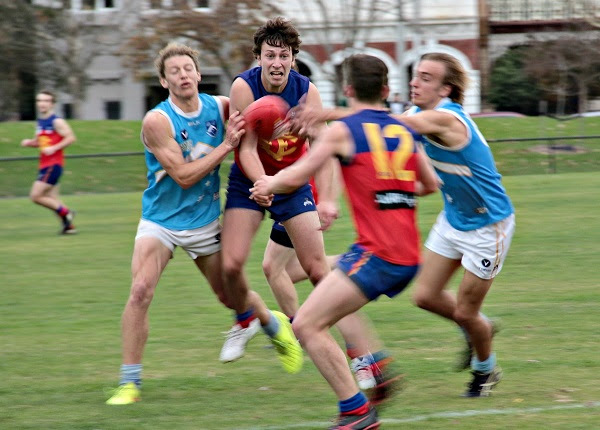 In his Board retirement, Tom is hoping to see an A Grade Premiership for Fitzroy. Tom’s great mate and Fitzroy Company Secretary, Bill Atherton, says “Tom is a lifelong Fitzroy member. He joined the Board 13 years ago when we were just a sponsor of the Reds and the Juniors. “He helped steer the Club to its merger with the Reds in 2008. He has always been a very active director and I well remember the trivia nights with the Fitzroy Juniors, where he would attend with Pauline and baby John in the pram. But he is best remembered for organizing the playing of the Fitzroy Club song before all home games. Despite the worries of his professional civil engineering business, he always said that the 10 minutes before the team ran out, was his most nerve wracking moment of his week! Thank you Tom from everyone on the Board and the Club. Let’s hope we can repay you with that A Grade flag! Fitzroy is a long way from the US, but two women are bringing a little piece of New York to the club. New not only to Melbourne but to Australian Rules football, Fitzroy-ACU Women 2 player Perri Quattrociocchi is from upstate New York, while team manager Yadira Perez Hazel was born and bred in the Bronx. Both knew of AFL while still overseas, but neither had ever picked up a Sherrin before moving to Australia. Perri, a systems engineer with an aviation communication company, “sold everything and moved here with a hope and a dream” in December 2016 after researching new places to live, and visiting Melbourne and loving it in 2015. Meanwhile Yadira, a cultural anthropologist and oral historian, arrived with her husband Clinton and two children in February 2016 ready to start the next stage of their life in a new city. They had never visited before but were told by friends “you’re going to love Melbourne”. 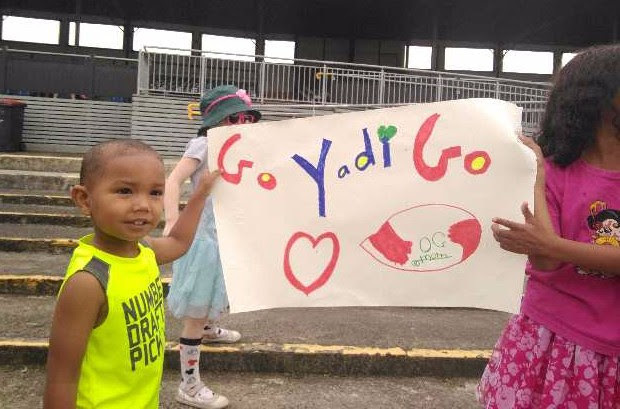 While they hail from a similar part of the world, Perri and Yadira were drawn to Fitzroy for different reasons – Perri, due to her long history in sport, and Yadira due to the community and culture involved in a local football team. Perri, who has long played soccer and roller hockey as well as American football, was pointed in Fitzroy’s direction by a friend after saying she wanted to try Australian Rules. “I walked into practice a few months ago. No joke! 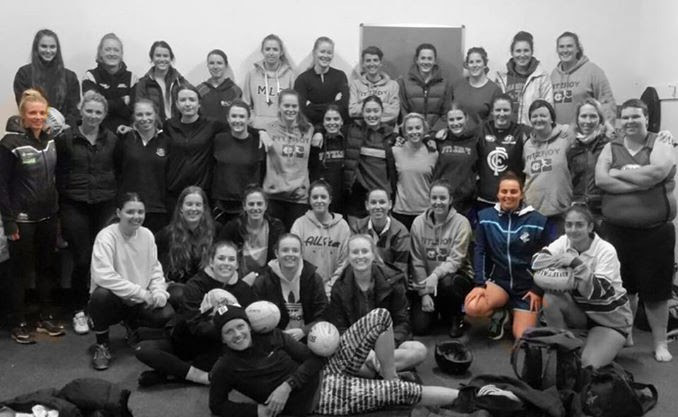 A few of my friends gave me a quick intro into hand passes and kicking once, and then two weeks later I wandered by a Fitzroy practice,” she says. While Perri says gridiron and Aussie rules are quite different (“American Football has a lot of start-and-stop where AFL is constant movement”), her sports history has helped her adapt to her new game. “I wouldn’t say that American Football or hockey are very close to footy, but having quick feet, a big kick and no fear in tackling has definitely helped my transition to AFL,” she says. Yadira, new to contact and organised sports, joined Fitzroy this year with her neighbor and now co-team manager Stacey, who was also new to Melbourne after moving from Western Australia. “Stacey told me, ‘I know you said you wanted to get involved in a community organisation, and I know you like group fitness. I was thinking of going to check out this womens’ footy team…’ And the anthropologist in me was like ‘Ooh, footy, Victorian culture! This is the way to get involved locally and get to know something that’s pretty big in this part of Australia’,” she says. 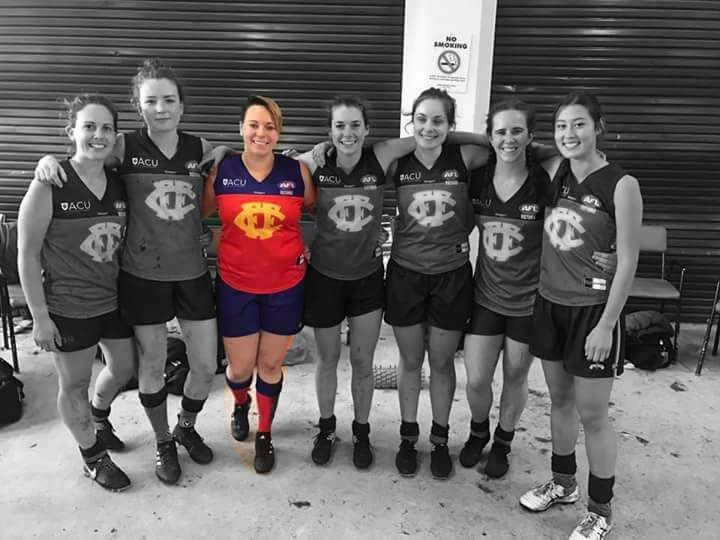 Both women say their favourite aspect of being part of the club is the Fitzroy-ACU Women 2 team, who have supported them while they learn Australian Rules. She says she has learned the game by “being transparent and being open to making heaps of mistakes,” as well as taking the advice of her teammates. “They say I’m a really good tackler, but you can’t tackle people if they don’t have the ball,” she laughs. 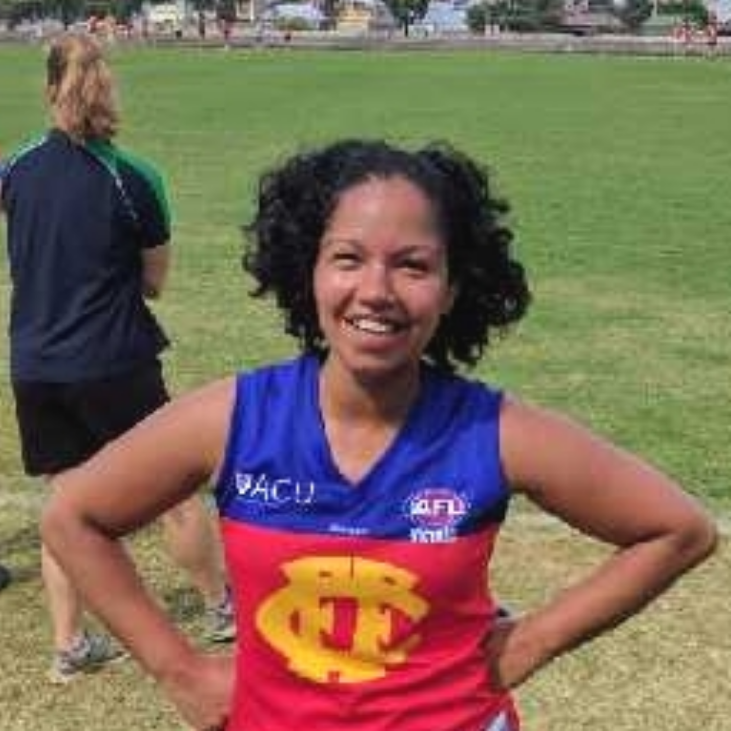 While team manager this year, Yadira is training with the team and developing her knowledge of the structure and rules of the game, so she can take the field as a player for Fitzroy-ACU Women 2 in 2018. Both of Fitzroy’s New Yorkers say they love the diversity and culture of their adopted city. Perri says she enjoys Melbourne’s art and people. “This city embraces art; street art, live exhibitions, museums, sculpture installations, Aboriginal tributes, festivals (White Night being one of my favorites)…the list goes on. In terms of the people, I have traveled all over the world and this is one of the few places where the average person is not only friendly and helpful, but truly loves where they live. It gives the city such a welcoming vibe,” she says. Neither Perri nor Yadira have yet completed their Melbourne transition by adopting an AFL team – Perri says she’d like to be around for a season first to get a feel for the teams, while Yadira says she is open to finding a team, but hasn’t chosen one yet. Yadira’s daughter, however, has chosen the Hawks as her team, and has proven to be a quick learner in Melbourne football culture. “She is really invested in it. We take the train, and if we stop in Collingwood, she boos,” Yadira laughs. Where are you going for your next holiday? Why not have a $3000 contribution to your next trip? A $3000 travel voucher to the destination of your choice is the first prize in Fitzroy Football Club major raffle for 2017. Tickets are now on sale. This is the major fundraiser for the club for the year, so please get on board. If you are able to sell some tickets at your workplace or amongst family and friends, even better! Books of tickets are available from Anita Roper (email roperanita@gmail.com) or can be arranged through any of the other Fitzroy Directors. You can purchase tickets from any Fitzroy player, at home games at Brunswick Street Oval, and via the Fitzroy website. Have you selected your partner for tomorrow night’s three-legged event at the Royal Derby? All Fitzroy players, friends and supporters are invited to come along and embrace the three-legged theme, dress up and win the prize for the duo which stays tied together the longest. There will be penalties for the Fitzroy team mates who drop out first and lose their partner. In fact there are quite a few rules, which you can see here. Of course, you are welcome to just come to The Derby untied, have a meal, a few drinks and a laugh. The night trips off at 8pm at The Royal Derby Hotel on the corner at 446 Brunswick Street. Entry is free.